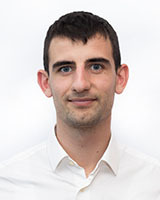 Arber Kukaj is a software developer from Kosovo and a professor assistant in the Riinvest College in Pristina. He is creative, passionate and experienced in software engineering as well as teaching. With a BSc degree in Computer Science and MSc candidate, he is the perfect team member. Furthermore, with a variety of skills in the software development environment Arber can be valuable in every project of software engineering. As part of the winner team in the European Youth Award I‘m very happy and cannot wait to present our project in front of the EYA community in Graz. As a team we worked to create something valuable for our blood transfusion center and above all to help those people in needs. I expect our team will win from this great opportunity in order to advance the Blood Donor platform. Finally, we are highly motivated to corporate with other people or to be beneficial for others in this contest."